Nearly four years after their last album, Places Like This, Architecture in Helsinki are finally back with a brand new record. 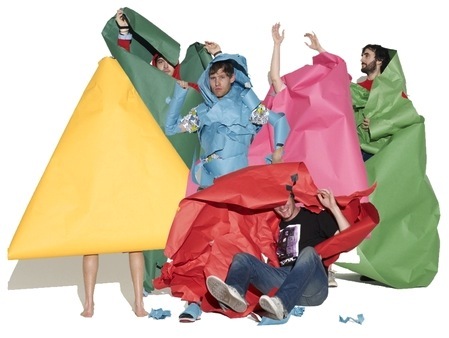 The Melbourne-based electro indie outfit, which made their debut in 2003 with the pop-infused Fingers Crossed, recently announced that they would release their long-awaited fourth studio album in April in Europe and May in the US. Originally comprised of three childhood friends Cameron Bird, Jamie Mildren and Sam Perry, AiH became a hobbyist combo in the year 2000, and has morphed through as many as six different line-ups during its tenure, always centered around the songwriting and singing of Cameron Bird. The band currently consists of Cameron Bird, Kellie Sutherland, Sam Perry, Jamie Mildren and Gus Franklin. They have released three albums to date, Fingers Crossed in 2003, In Case We Die in 2005 and Places Like This in 2007, each of which has seen the band navigating completely different musical terrain. Let’s reminisce with two excellent tracks “That Beep” and “It’5”!